When we last saw the Weekender venue late on Saturday night, the ground was a wet sludge of mud and grass. The rain had started getting irritating, clothes were splattered with filth and everyone was generally miffed that they had to miss some great artists. The atmosphere in the bus to the venue on Sunday was rather subdued. People kept glancing up at the menacing grey clouds seemingly speeding along with us to the venue. A couple of people behind us were grumbling that this wasn’t a cheap festival; washed out stages won’t get you your money back, whether you saw artists or not. And we were quite inclined to agree with them. Dance music greeted us upon entry into the venue, but it wasn’t as enticing as Dakta Dub yesterday so we moved on to the Bacardi Arena area. 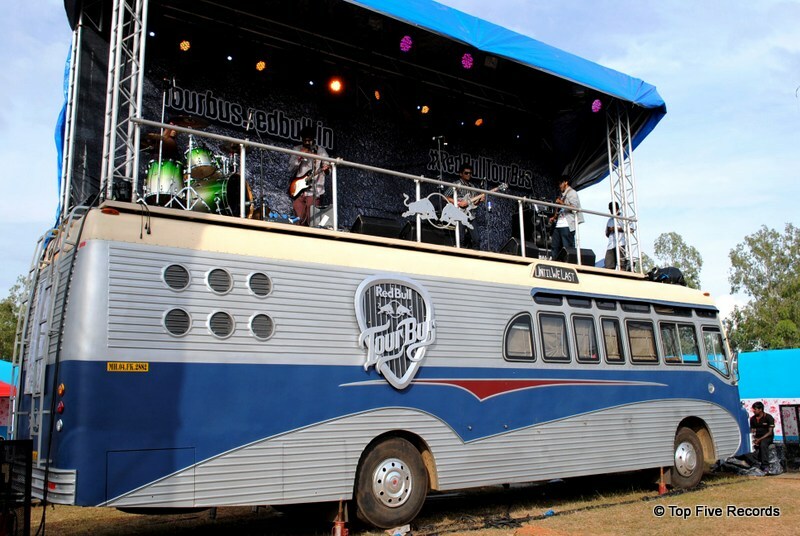 To our pleasant surprise, we found that the Red Bull Tour Bus stage was functional, and protected with a thick tarpaulin roof to boot. The show, it seemed, will go on. 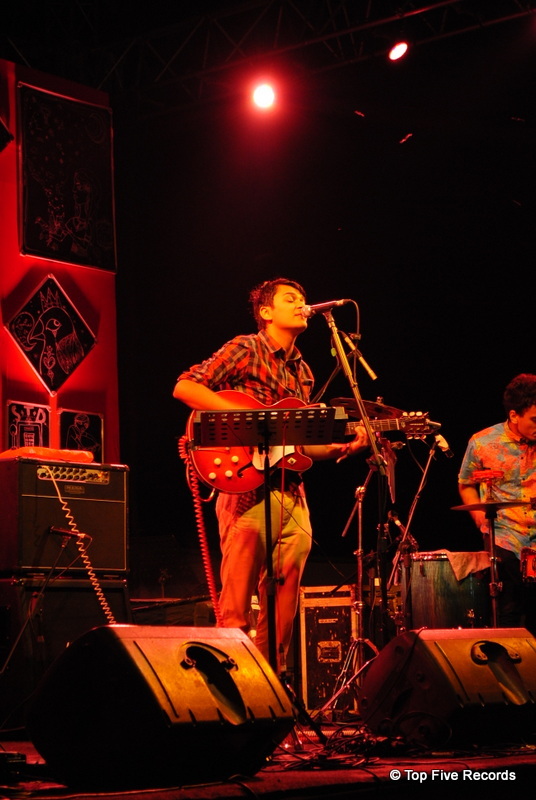 The first artist up was a dreamy post-rock band from Bangalore called Until We Last. More than a little reminiscent of God Is An Astronaut, the band filled the stage and our heads with deep, complex and emotive music. After the rather harrowing experience on Saturday, it felt great to lounge on the grass on a Sunday afternoon, listening to atmospheric, thoughtful music. Perfect! Now, it’s important to note here that the Bacardi Area and the Red Bull Tour Bus stages faced each other; to get from one to the other, you only had to cross a small stretch of ground. This turned out to be a stroke of logistical genius, we soon realized. Ten seconds after the beautiful dream of Until We Last faded away, classic rock started pouring out of the speakers at the Bacardi Arena, where The Fender Benders had just begun their set. 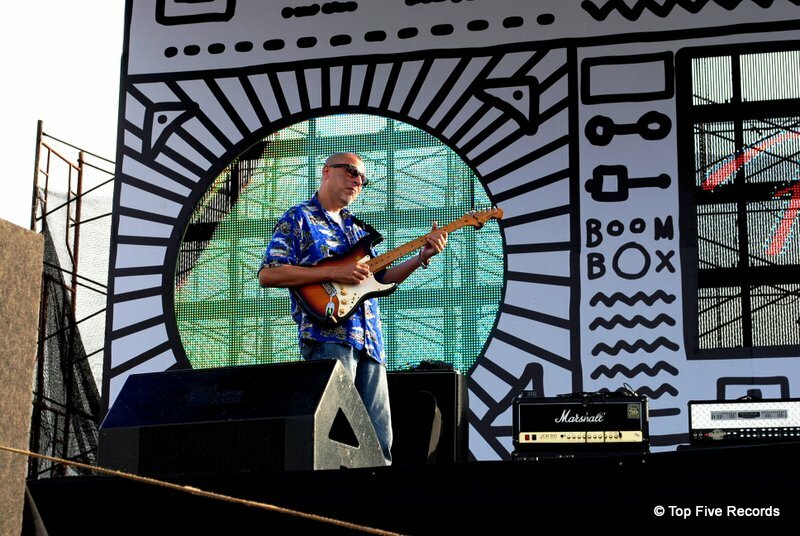 With true Indian legends like Amyt Dutta and Sanjay Divecha mesmerizing us with their Fender fretwork, it seemed impossible for the jazzy blues jam to get any better – until, of course, Mr. Warren Mendonsa himself stepped on stage. Jayanta Dasgupta’s Clapton-like swagger, Jai Row Kavi’s immaculate drumming, and Mendonsa’s mindblowing solos added to an atmosphere at the Arena that is impossible to put into words. In one fell swoop, everyone present felt that the Weekender already paid its dues for a washed-out Saturday, and then some. The most magical moment of the set by far was when the whole ensemble performed the blues standard “Let the Good Times Roll” even as rain clouds rolled in. Whether it was a heaven-sent sign, a spirited directive or just a plain coincidence, it does not matter; that one minute became the Weekender’s Moment to Beat. Needless to say, it is not an easy task to follow an act like the Fender Benders. 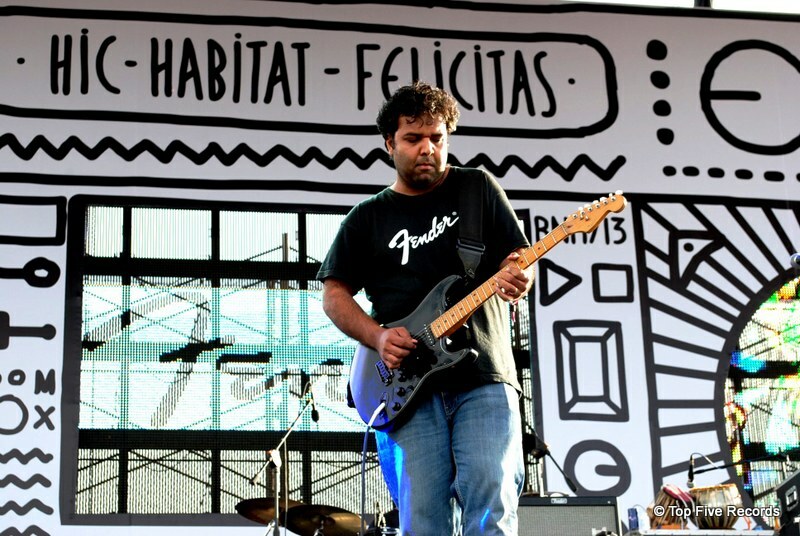 And few bands can live up to the challenge quite like Skrat, a spunky grunge/garage rock band from Chennai. 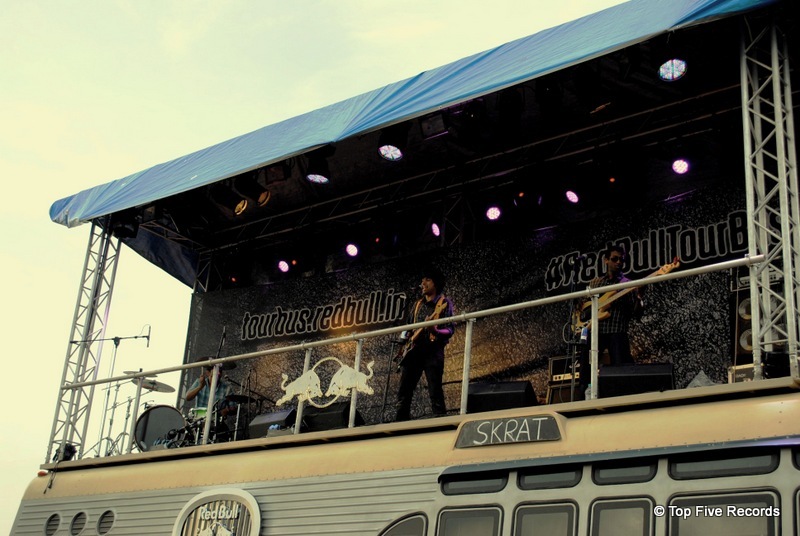 Sriram TT and his boys wowed the crowd from atop the Red Bull Tour Bus with their wild songs and unstoppable energy. Favorites like “Tin Can Man” crazed old fans and created new fans, while newer songs like “Samurai Badass” left everyone in awe of the young band’s raw talent. Props to Skrat for rousing up an enthusiastic and wholly unpretentious crew, too! The second Skrat ended their tight, killer set, it was time to run back across the lawns to the Bacardi Arena, where the Baiju Dharmajan Syndicate began their set. 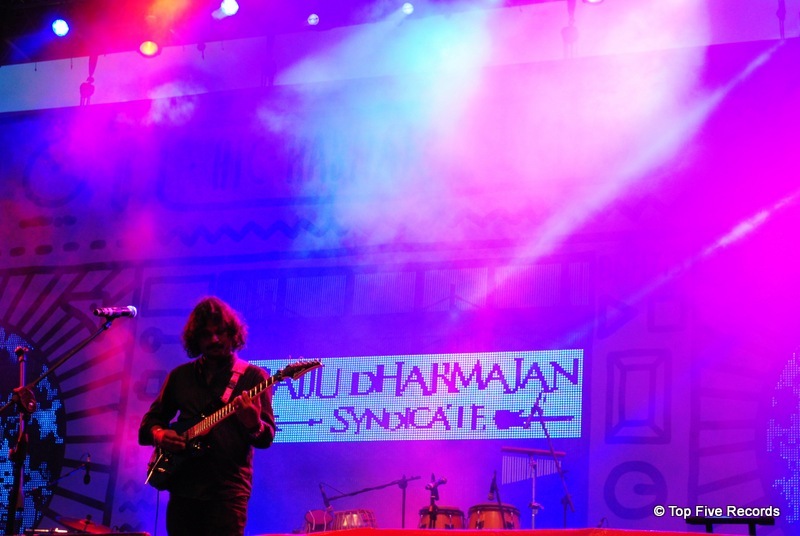 The ex-Motherjane guitarist, self-styled as a Carnatic Guitar Maestro, led the audience into a mystical light and sound extravaganza that seemed to end all too quickly. If there was a negative about the act, it was the presence of the Syndicate’s rather douchey singer who tended to overpower Baiju’s soaring, poignant guitar. Finally, at around 6 pm, we caught our breath at Maria’s Goan Kitchen, located right near the now-hallowed Bacardi Arena and the Tour Bus stages. And not a drop of rain so far! Papon & the East India Company, headed by the talented Papon, were already setting up at the Bacardi Arena, but I rushed to the Other Stage for a promising set by my new favorite singer-songwriter Nischay Parekh. The Calcutta lad shot to fame during the festival A Summer’s Day, helped along by his phenomenal love song, “I Love You Baby, I Love You Doll”. Nischay’s colorful stage presence and beautiful voice was the icing on the cake of the unforgettable three hours so far. After Nischay’s short and sweet set, I headed back to the Bacardi Arena, where I found the crowd in a sort of frenzy. 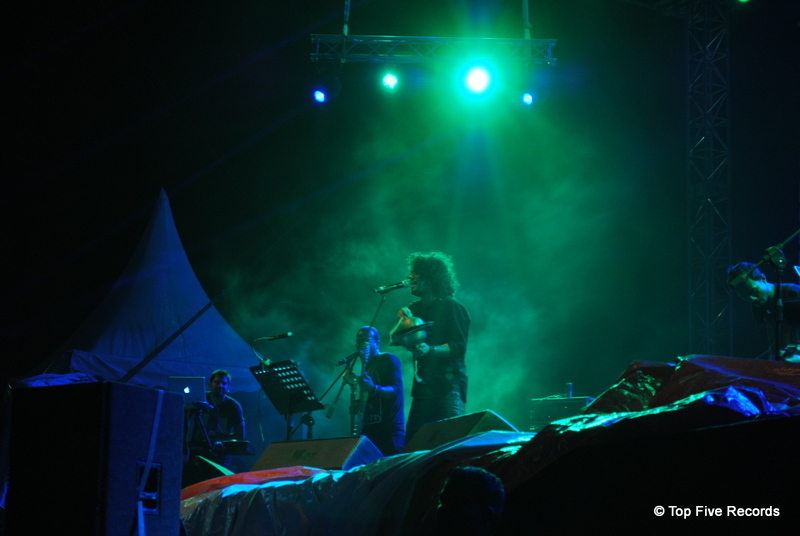 And for good reason – Papon was singing “Banao”, his famous ode to Ms. Mary Jane! He closed off his set with a spectacular Assamese folk song about the Baisakhi festival, managing to get everyone (and I mean everyone) on their feet. Papon really has it all: grace, humility, stage presence, and a killer voice. I felt almost honored to see such a great artist live! After 5 busy – and completely dry – hours, the crowd seemed to be trying to get rid of the ‘dry’ness in a different sort of way. By the time Australian indie rockers Hey Geronimo took over the Red Bull Tour Bus, only a handful of people managed to stay on their feet. The rest were plopped on the grass, finishing the last drops in their Bacardi buckets, and stayed that way through most of Swarathma’s set too. Hunger coupled with tiredness from hours of non-stop excitement kept me away for nearly all of Karsh Kale Collective + The NH7 All-Stars but I’d already got my money’s worth. And no, it didn’t rain a single drop on Sunday. So there you have it. Day 2 certainly filled us with music-induced happiness, but also left us with a sort of wistfulness of what Saturday might’ve been, had the heavens not opened up. Overall, the Weekender was a great, if not grand, success, and I’m certainly going to be back next year. In any enjoyable event of considerable length, there are always a few moments that shine a bit brighter than others. It’s not always clear why these moments in particular make it into this mental photo album. Maybe it was the confluence of several senses hitting you simultaneously. Maybe your mind just chose the most colorful, the most shocking or the most fun parts. Or maybe it was the way that you were both suspended in a moment that seemed to go on forever even as it ended too quickly. When I flip through my mental photo album of the Bacardi Weekender 2013, Bengaluru edition, I don’t see the rains that played spoilsport on Saturday. 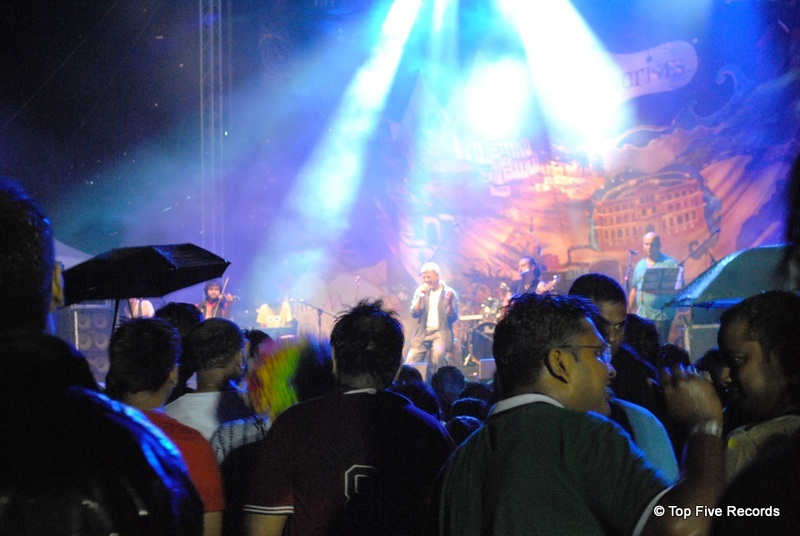 I don’t see people craning to catch a view of Lucky Ali or Manganiyar Seduction betwixt myriad umbrellas. I don’t even see the fuming mob when TessaracT got cancelled. Anyway, the rather convoluted point that I am trying to make here is that at this year’s Bengaluru edition of the Weekender, the show really did go on. A sizeable chunk of artists, cutting across all genres, were cancelled on Saturday, and people stood drenched to the bone for hours to watch the artists that were lucky enough to perform. But they didn’t seem to care. When we left on Sunday night, there was no doubt that we were indeed leaving the Happiest Music Festival, in spite of every hiccup. Let’s start from the beginning. Day 1 started off with a bus ride (Red Bull included!) that foretold of the day to come, with rain sprinkling fitfully as we headed to the venue. 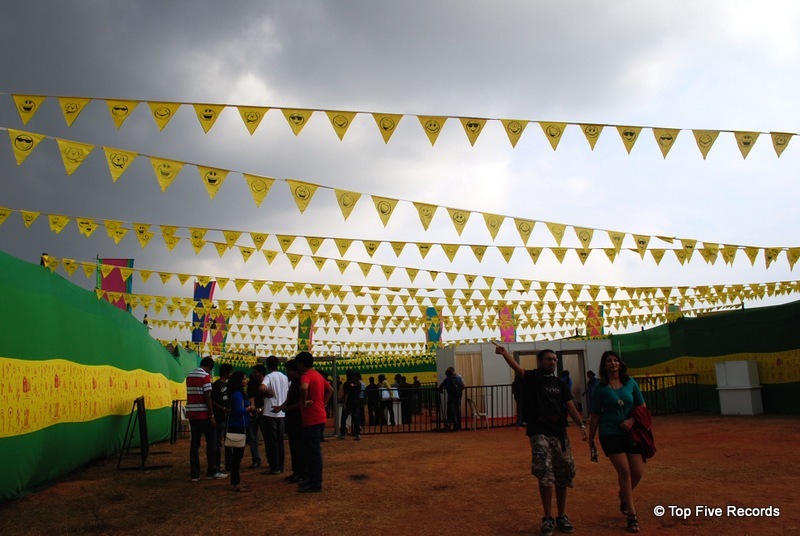 Once we got in, we marveled at NH7’s kickass aesthetic sense for a few minutes before heading straight to the stages. Unfortunately, the rain followed us there. However, the spirit of the festival-goer is not daunted so easily. 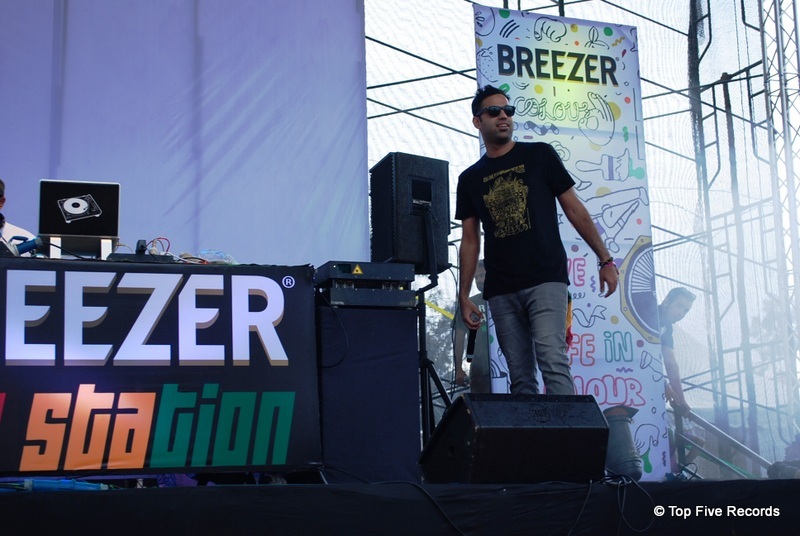 We headed to the Breezer Stage, where Dakta Dub was entertaining the fast-filling crowd with their reggae beats. An unfurled Jamaican flag graced the laptop table. Dreadlocked members of their entourage danced with abandonment. A light rain, buoyed by breeze (get it? ), tempered the air, and the stage turned electric with magic. Oh, and then Dakta Dub started playing Bob Marley’s “Get Up, Stand Up”. First entry into the photo album! However, the next couple of acts didn’t fare so well, in my opinion. I never have been a big fan of metal, especially mediocre metal, so Bevar Sea at the Bacardi Arena really wasn’t anything to write home about. Singer-songwriter Winit Tikoo was rather forgettable as well. However, his song “GDS” did have a few nice moments from the band – especially the wall-like fuzz of the guitars and the confident bass. With the Other Stage and Red Bull Tour Bus closed on account of roof-less-ness, we wandered to the Eristoff Wolves Den, the only other open stage, where we found the excellent Big City Harmonics. This guy had it all – the visuals, the lights and oh my, the beats. Definitely a find! Here, too, I added to my photo album: the radial lasers hit the vertical sprinkle of rain to create millions of tiny stars in the daytime. However, I don’t possess nearly enough photography skillz to capture that in a real photo, so that moment shall remain in my mind only. Passing cursorily by Inner Sanctum (as I said, I’m not a big metal fan), we headed back to the Dewarists Stage for Lucky Ali. A seasoned performer, the man wowed the crowd with his stardom and sheer stage presence, and proceeded to sing everyone into a frenzy. By that time, the good folks at NH7 had made arrangements to temporarily open up the Other Stage, where they skipped past Sulk Station and the F16s (sadly) to Kate Miller-Heidke. 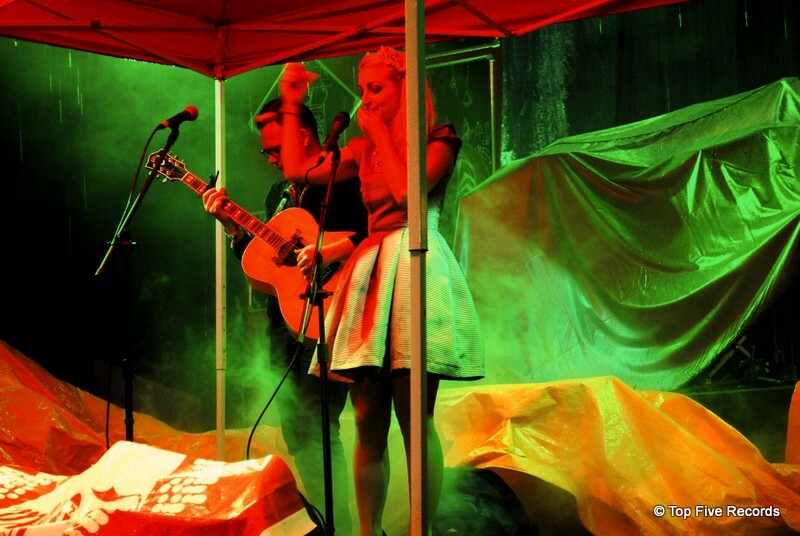 Under the makeshift red umbrella that sprouted up like a mushroom in the rain, the Australian singer-songwriter belted out gifted pop while dressed as Alice in Wonderland. It was a great experience! After a quick bite at Faaso’s, we headed to Eristoff again for Shaa’ir + Func, starring Randolph Correia, Monica Dogra, and Monica Dogra’s midriff. 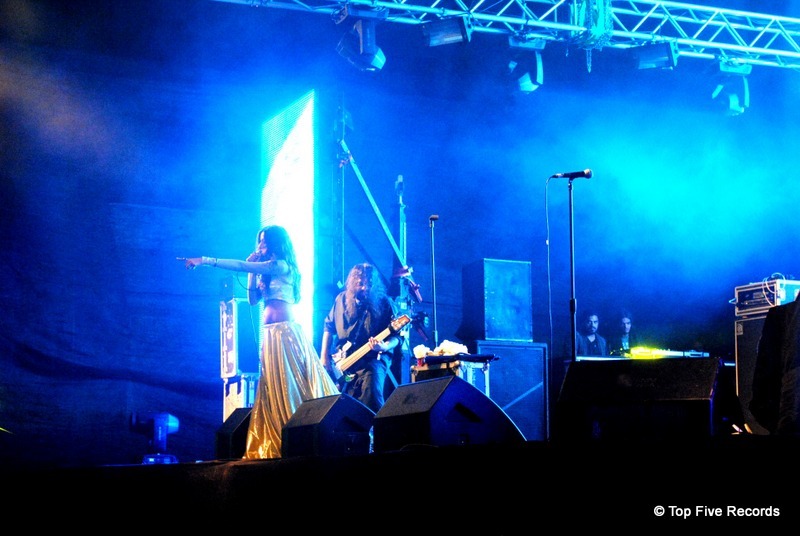 I’ve never been a big fan of the band – I’m guessing it has something to do with my gender and orientation – but I will allow the fact that Monica Dogra has matchless energy and stage presence. Visuals aside, however, their live performance failed to impress me for the same reason as their recorded ones: they don’t have memorable songs. 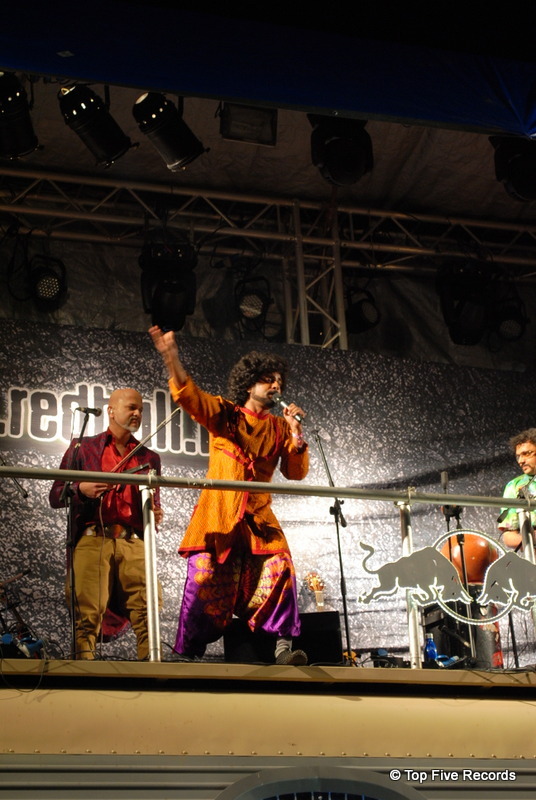 Soon, we left Ms. Dogra gyrating on stage to rush to the Dewarists Stage for the evening’s pièce de résistance (for non-metal fans), Manganiyar Seduction with Roysten Abel. The magic box of lights was already set up, piquing interest with its obvious theatricality. However, the uninitiated were simply left unprepared for the performance to follow. 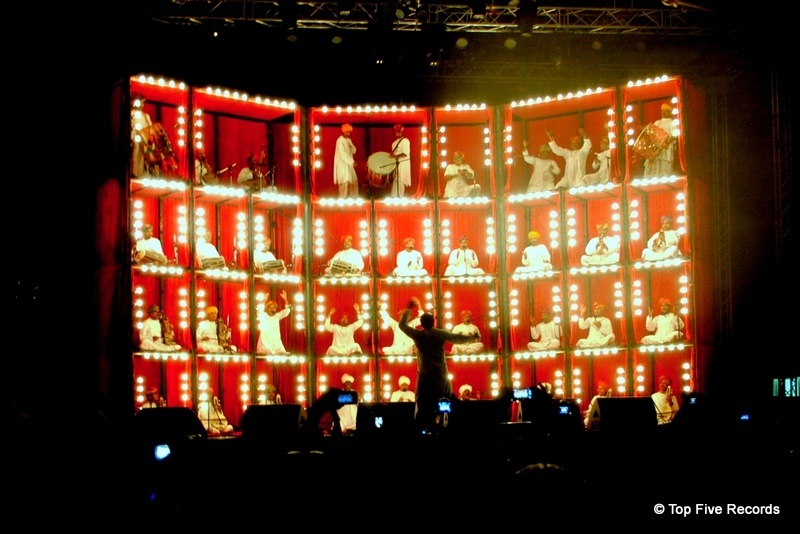 The way your heart flies as a Manganiyar singer lilts notes with his whirling hands; the thumping of your heart along with the big drums; the ecstasy when the rows and columns of the box light up all at once at the end… The moments are too many and too intense to recollect all at once. Needless to say, everyone in the audience was thoroughly seduced by the end. And thus ended Day 1 of the Weekender. The rain was the villain of the day, but thankfully there were quite a few heroes. We left the venue hoping for less rain and more magic on Sunday… and we weren’t disappointed. You may recall that I was one of the many people who were very excited about the CHVRCHES album that released earlier this year. I was however disappointed by the album, which made the tickets I had bought earlier to see them live seem a bit foolish. Thankfully, their concert was highly enjoyable, proving that decisions made with limited information are the best kind of decisions. I have a weakness for intelligent pop groups with a female singer and the CHVRCHES seemed right up my alley. Thoroughly anointed and highly hyped, they made a big splash before their album dropped and their singles were nothing short of glorious. It was just that the rest of their album could not match up to those high points. We all make mistakes and the world is littered with concert tickets of regret. Nevertheless, I didn’t dislike the album and I really liked some of the singles, so despite still feeling a little cheated, I made myself a little less unpresentable and stepped out. The opening act Basecamp was a rather typical opening act. Their music was acceptable, but the crowd seemed more interested in their conversations than in the band. This was reasonable, as despite Basecamp actually sounding good, their set had nothing stand out. This is the kind of band you want playing at a pub when out with friends, something that sounds good when you want to listen to the music, but otherwise stays out of the way. The CHVRCHES did not start out well. The beginning few songs were okay, but not quite up to the standard of their album. This culminated in a very sub-par version of “Lies“, by far my favorite of their songs. However, once their initial hiccups were out of the way and they fell into the flow of their music, the concert became quite good. I’m more than willing to forgive a few missteps from a jet-lagged and slightly sick band and the way they powered through the rest of their set made doing so trivial. “Science/Visions” was impossibly good and “The Mother We Share” was very strong. There was also a very hammed-up “Under The Tide”, but these things happen and it was the only time Martin Doherty got the spotlight. There is a reason that Lauren Mayberry is the front of this band and for most of the show she had it. The band took plenty of time during their set to chat with the crowd, which incidentally was the most enthusiastic crowd I have ever seen. The teenagers at the Marina concert may have had more energy, but these fans made up for that in dedication. The talking was fun, if often inaudible, and honestly the band did need something to stretch out their performance a little. They only have so many songs to perform after all. Maybe it was the concert setting, or maybe it was the intense light show that went on throughout the concert, but I think that it was just that they are a great live band. This was a highly enjoyable night for me and one that I will definitely repeat when they next come to the area. Elvis Costello and The Roots have both always been more smart than successful and teaming up does nothing to change that. It does result in a very good album though, although an unabashedly smart one and unapologetically demanding one. The first thing to note of this album is the grooves. The Roots have done a fine job laying down a soundscape and Costello’s production can be felt everywhere. His voice also, rather surprisingly, blends excellently into the music. As expected of a Costello album, the lyrics are layered and intelligent, much more so than the R&B and funk that this album draws from. The result is an album that greatly rewards multiple close listens, but never makes doing so a chore. I highly recommend it. Live Today, Derrick Hodge’s debut album for Blue Note, is an extraordinary contemporary jazz album. It is not only eclectic, with roots ranging from Herbie Hancock to prog rock to neo-soul and hip-hop. This is that rare album that not only provides something for everyone, but provides something excellent for everyone. The variety makes it very hard to pick out a specific highlight, as there is something that appeals to every taste and they are all impressively strong. If you are into progressive rock or the works of Bela Fleck, then Message of Hope will be more than you could have hoped for. Derrick Hodge keeps a memorable melody going throughout accompanied by the drums and keys and then the whole thing breaks down into what is essentially rock. The titular song Live Today shows Common off quite well to make some classic jazz-rap. Dances With Ancestors is a sprawling, brilliant ballad and there is even some straight-up folk-pop with Holding On To You. This is a contradiction of an album, dense yet approachable, diverse yet focused, soothing yet provocative. This is the album you recommend to a friend to get him into jazz and the album you pull up to counter claims that jazz died in the sixties. This is the album you should recommend to everyone. I really like Janelle Monáe. She’s really smart, wildly imaginative and makes music that not only defies classification, but is just simply very good. Getting to see her live is something that I have been looking forward to for quite a while, and she did not disappoint. The opening act was led by a man named Roman GianArthur, whom I had never heard of before. The loss there was entirely mine. He took a crowd impatient for Ms. Monáe and converted them to his cause in a heartbeat. Admittedly, his sound is not that far from that of the parent act, but that is in no way a slight. I wouldn’t have gone to the concert if I didn’t want to hear some funky R&B. Excellent stagecraft, excellent singing and just an excellent show. I will be sure to see him again when he next tours, by which time I’m sure he’ll be headlining. Until then, I’ll just have to be satisfied with the prospect of his upcoming album and his single I-69. Janelle Monáe’s show started, as it must, with an overture, which was quite nice. The first couple of songs, Givin’ Them What They Want and Dance Apocalyptic were good, but had me a little worried. Albums as immaculately produced as The Electric Lady don’t always translate well to the roughness of a concert hall’s sound system and the rough edges on the first songs threw me at first. However, the energy of a live performance more than made up for an minor issues and the music smoothed itself out rapidly. Also, her stagecraft is to be highly commended here. Small skits did wonders to set the science fiction theme and the entire stage was active every moment of the performance. Much though I liked her last album, I was very happy that she didn’t limit herself to just the Electric Lady but also treated us to her past hits including a very good Cold War and an intense solo Tightrope. Her solo work during this concert was highly impressive. She tends to be the star of every song she sings, but I’ll admit to being unsure of how well she could carry off some of her collaborations alone. Not only was Q.U.E.E.N. excellent with just her, but a very tender Primetime was probably the strongest moment of the show, although an extended Mushrooms and Roses as psychedelic as anything San Francisco has ever heard did come close. The concert ended with a cover of Prince’s Let’s Go Crazy and the aforementioned Primetime followed by a very, very extended Come Alive that had Janelle Monáe motion the entire audience down to the ground, and while we were all crouching and craning to see what was going on, she told us that is what it is like to be short. This was a novel experience for me. As expected from Janelle Monáe, this was an imaginative, fun and high quality concert. I enjoyed every moment of it. She has shown us the future, and my God, it’s full of funk.